For the first time since 1952 the United National Party is contesting every single electorate in Sri Lanka at the forthcoming general elections. General elections have been announced for the 10th of October, 2000. Nominations of candidates closed at 12 noon on 4th September. The People's Alliance government is in disarray, as the elections approach. The PA was only able to command a one seat majority in Parliament from 1994 to 2000. This forced the PA to be a weak regime, vacillating to the demands of the tiny minority parties that constituted it. Some members of the PA have already crossed over to the UNP, either to appear as candidates or national list members, or to provide support. It is probable that the parliamentary elections of 10th October will return the UNP to power with a strong majority in parliament. Two UNP supporters were murdered by the People's Alliance Government gangs. Click here for details. The United National Party held it's 53rd annual convention on Saturday, 2nd September 2000 at the Colombo Town Hall premises. The convention was presided over by the leader of the party, the Hon. 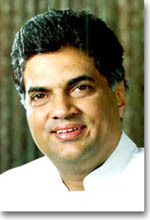 Mr. Ranil Wickremesinghe. Chairman of the Party Mr. Karu Jayasuriya, Secretary Hon. Mr. Gamini Athukorale and Treasurer Mr. Milroy Perera were also present. Mr. Karu Jayasuriya introduced the election manifesto to the party. Speakers of special note were Hon. Mr. R.A.D. Sirisena, Hon. Mr. Anura Bandaranaike, Hon. Mr. W.J.M. Lokubandara and Hon. Mr. Ranil Wickremesinghe. Well known actor Mr. Ravindra Randeniya also made a special appearance and announced his entry into active politics.